The mood at the site of Hillary Clinton's election night gathering, the Javits Center in New York City, appears to be highly stressed and sullen at the moment. 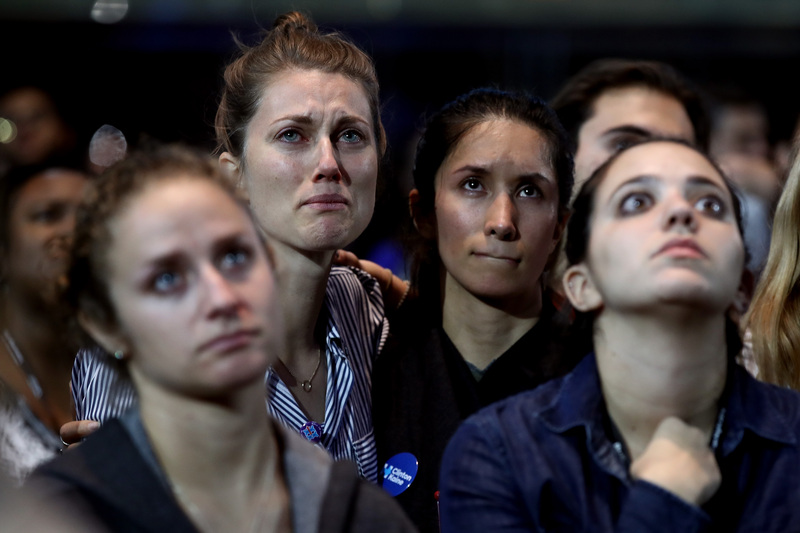 Twitter users are reporting that some Clinton supporters are already leaving the event, while others are highly emotional, crying, and expressing their utter disbelief at the closeness of tonight's race. For Clinton supporters, the Javits Center was always supposed to be the site of her election day victory speech. The spot was particularly chosen for its ornate glass ceiling, which Clinton was supposed to symbolically shatter while giving her speech. While it certainly remains possible that Clinton could give this victory speech, her odds of doing so tonight are much slimmer than anticipated, which is the impetus behind the somber mood currently prevailing over the gathering. This mood is highly evident in social media posts from the gathering. US Weekly shared an Instagram photo by Jeff Ross showing Clinton's wide array of celebrity supporters present at the gathering looking distressed and downtrodden. On Twitter, users shared upsetting photos of Clinton supporters tearfully awaiting more results, including one particularly distressing picture of a young women curled up on the floor of the Center, seemingly crying. The images of Clinton supporters at the Javits Center are symbolic of the shock that many must feel considering the difference between the projected outcome of election night and the results that have been unfolding. In the weeks leading up to Nov. 8, Clinton was largely favored to win the election by various media and polling outlets. However, as tonight's unfolding results indicate, Clinton has lost races in several key swing states in which she was slightly favored to win, including Florida and North Carolina. Instead, Republican presidential candidate Donald Trump won both of these states, significantly diminishing Clinton's chances of victory. While this expression of emotion is absolutely understandable given the tense nature of this election night and the unexpectedly close race, it is still important to remember that this race is not over, and either candidate could still win the presidency. In the meantime, as we await the final results, some social media users encouraging everyone, Clinton and Trump supporters alike, to unite and find kindness for each other. As President Obama said in a video filmed earlier this evening for BuzzFeed News, "no matter what happens, the sun will rise in the morning and America will still be the greatest nation on Earth," words which, coming from a sitting president, can hopefully provide some comfort in a very angst-ridden evening.